Napa Computer Bus: In 1983 more than 3,000 school children throughout California's Napa Valley were treated to hands-on experience with ATARI computers. A refurbished school bus with 17 ATARIs on board circulated among the 21 public schools in the district, giving each fourth-, fifth- and sixth-grader several opportunities to work with Atari's PILOT language. 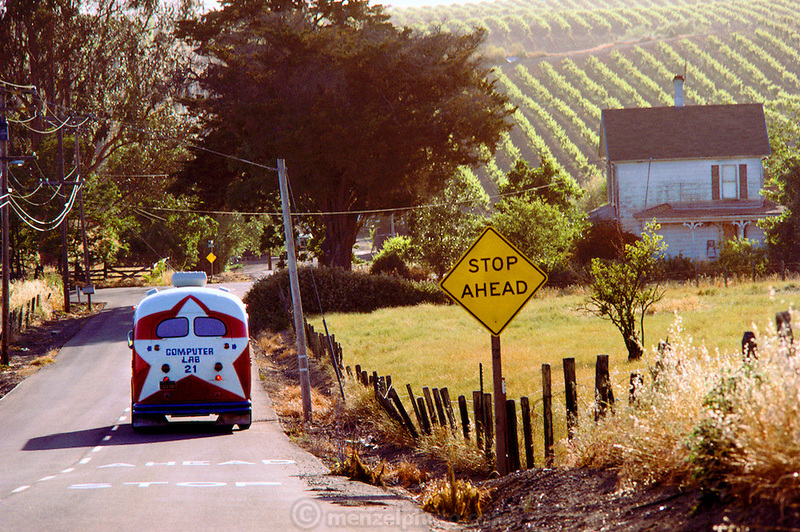 An old school bus (circa 1953), provided by the district, was painted red, white and blue and named the Napa Valley Unified School District Computer Lab. The lab accommodated 32 students at a time with each child sharing a 400. Each learning station also included an 11-inch Quasar television for video display and a cassette recorder for storage. The instructor's station was equipped with a disk drive and dot matrix printer as well as a TV and tape recorder. Seen here in rural Napa County.